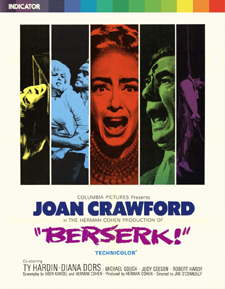 During the “hagsploitation” boom of the late 1960s, which is primarily remembered for latter-day performances from Bette Davis and Joan Crawford, Berserk came into being due to producer Herman Cohen’s desire to make a horror film set at a circus. It was also one of Joan Crawford’s final films as she would eventually retreat from the spotlight for the rest of her life. In the film, Crawford is Monica, ringmistress and co-owner of a circus along with her business partner (Michael Gough). When fatal accidents begin to occur, killing the performers in the process, detective Brooks (Robert Hardy) takes a look at a number of suspects, including Monica, her new tightrope walker (Ty Hardin), her daughter Angela (Judy Geeson), and another member of the company (Diana Dors), who firmly believes that Monica is behind it all. Berserk is an odd and uneven film. It’s not really effective, but it’s full of weird moments and dialogue. There’s even a full-blown musical number at the end of the film with less than a half an hour to go, which seems to come straight out of nowhere. A lot of time is also wasted by presenting circus performances in progress. To some degree it’s crucial since that’s where the film takes place, but it merely pads the running time more than anything. According to critic Jonathan Rigby, the circus received this attention due to a stipulation by the actual owner of the circus that it would get plenty of screen time – almost like product placement in a way. Joan Crawford is her usual self, although I personally disagree with critics of the day who praised her as I feel that she’s not in top form. Even though she had a lot to say about the film’s script and title (which was originally Circus of Blood), she doesn’t give much of a performance and some of the other actors do manage to upstage her. The film is also hampered by a severe lack of Michael Gough, who is in and out the film too quickly (which isn’t a spoiler as his demise is plastered across the film’s poster). All in all, Berserk is an interesting footnote in Crawford’s late career, but it isn’t really much more than that. I have a feeling that without her and the circus owner’s interference, it might have made for a more effective horror film. It certainly contains those intended moments of suspense that you would expect, but they’re hampered by too many outside influences. Indicator’s Region Free Blu-ray release of Berserk features a nice transfer provided by Sony Pictures. Grain is solid with high levels of fine detail, particularly in close-ups. Some softness occurs during title overlays or scene transitions, but everything is fairly sharp and precise otherwise. There’s also great color reproduction – the setting being a circus, there’s definitely a variety of hues to take advantage of. Black levels are deep with some built-in crush while everything else appears bright, crisp, and stable, with only minimal speckling leftover. 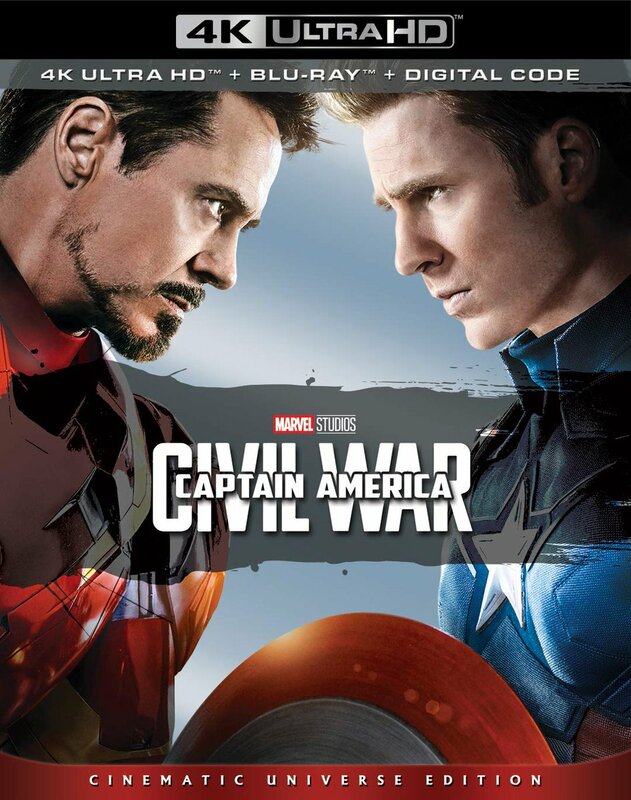 The audio is presented as an English mono LPCM track with optional subtitles in English SDH. Dialogue is well-rendered and discernable, but sound effects are a tad weak. The score is mixed in well, but it doesn’t have a ton of heft to it either. Everything is clean and clear with no instances of leftover hiss, crackle, or distortion. Extras include The NFT Interview with Joan Crawford, a 14-minute audio-only interview that was conducted in 1956 at the National Film Theatre in London; an extensive audio commentary with authors Lee Gambin and Eloise Ross; The Shopgirl’s Delight, a 15-minute interview with film critic Pamela Hutchinson about Joan Crawford’s career; Circus of Blood, a 32-minute interview with film critic Jonathan Rigby about the film’s production and release; Didier Chatelain on Herman Cohen, a 14-minute interview with the head of advertising for Herman Cohen, who speaks about his previous employer; In the Ring, a 14-minute interview with the film’s focus puller Jim Alloway; Tom Baker’s Beyond Belief!, a 5-minute introduction to the film; over 21 minutes of outtakes from Tom Baker’s Beyond Belief! introduction; the theatrical trailer; an image gallery featuring 39 stills of behind-the-scenes shots, on-set photography, lobby cards, and advertising materials; and a 40-page insert booklet with the essay Berserk! by Josephine Botting, An Interview with Herman Cohen by Tom Weaver, Joan Crawford’s Media Circus by Judith Axler, Diana Dors: Going Bust by Donald Zec, a set of critical responses, the film’s poster, and presentation details. Indicator certainly gives Berserk a more prestigious presentation than Mill Creek’s stateside barebones Blu-ray release (paired with Strait-Jacket no less). It’s not really a good film, but it’s certainly interesting and memorable, most assuredly in ways that the filmmakers didn’t intend.